This album, recorded at the Alchemia Club in Krakow, Poland, May 5th 2016. Reedist Ken Vandermark who needs not a too thorough introduction here on FJB, is here heard with Klaus Kugel on drums and percussion and Mark Tokar on double bass. German drummer and percussionist Kugel is a veteran in modern jazz that can be heard on more than fifty albums since the early nineties. He’s played with everyone from Peter Evans to William Parker to Jemeel Moondoc. He’s been in Theo Jörgensmann Quartet, Switchback and Baltic Trio. It’s an exhausting discography, and I must admit I have a lot of homework and a lot of exciting listening to do when it comes to Kugel. Bassist Mark Tokar from Ukraine is at least for me most known for his work with Vandermark on the majestic 10 CD box ‘Resonance’. I’m very keen on hearing him with Martin Küchen and Arkadijus Gotesmanas on their Live at Vilnius Jazz Festival album released on No Business Records. Writing this I’m realizing that they do have digital options to purchase on their website. I’ll go get it right now. The album starts off the ’13 songs’. I can listen to the first seconds of this song 1000 times and still get a smile on my face every time. Ken and Mark start the song with a bluesy, swinging intro. I close my eyes and sink into the good feeling of a nice groove. But then Kugel joins in at a blistering pace. He’s on a different planet. It’s such a great dissonance, and done with such a delicacy that it just makes me very happy. Tokar gets lured over to join, but Vandermark is not yet done. He’s determined to keep on swinging, albeit with bursts of energy here and there. Eventually Ken too is ready to let it all out there and together they charge onwards to end the song. What a start of an album! ‘Automatic Suite’, a 15 minute more free and improvised performance. It has drummer Kugel using a wider set of equipment to accompany his friends. Vandermark who’s working closely together with Tokar. Ken introduces a 3-note ticking beat, but it’s only heard twice – and in between free excursions away from the theme. Ken then changes the direction with a thumping beat of doom and gloom. I immediately draw a line to Mingus ‘Better get hit in your soul’ which theme fits well on top of the beat, at least in my head. I can’t help it, it just keeps repeating. I even expect it to come in from a mysterious fourth member on stage at the Alchemia Club, but of course it doesn’t. Instead Ken keeps changing the melody around while the steady beat keeps playing in the background. I’m waiting for the fireworks to happen and for the song to move into another dimension but that doesn’t happen. Not to worry, there’s more to come on this album! Third song, ‘Flight’. This part of the review is actually also written on a flight, between Frankfurt and London, after a 4 a.m. wake-up in Turin, Italy. I must admit, although I’m not at all scared of flying – the sounds heard in this song is not what I would want to hear during a flight… Metallic pieces are flying through the air, and what used to be a coherent “something” is now a dispersed swarm of “something else”. There’s an urgency and intensity throughout the seven minutes this one lasts for. I like it. Two more songs to go. ‘Rough Distance’ and ‘End Numbers’. On the first one there’s another change in character. It’s a longer improvised track, over 13 minutes. We’re back to hearing how Ken twists and turns melodies around. I’d say it’s a typical “Ken-track”. He’s moving effortless through structures and emotions, but there seems to always be a clear and propelling force onwards and forward. Halfway through, the rhythm section provides a change, a break, while Vandermark gets a bit of rest to bring on the remaining minutes of madness until it’s over. The final performance of this album takes us to a dark place. Searching sounds, something is sort of boiling beneath the surface. This starts off as a lonely song, again with Vandermark getting great support from Kugel and Tokar. But the song develops into celebration and swing and we’re left feeling grateful to have heard yet another great release with Vandermark. 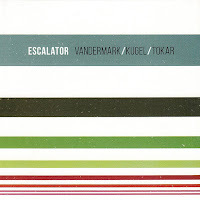 In summary, this is a Vandermark trio album, and what a competent trio it is. I can only assume the audience left the concert very pleased with that they just heard. Oh, Ken Vandermark, your output is generous and quality is always very high. Thank you.